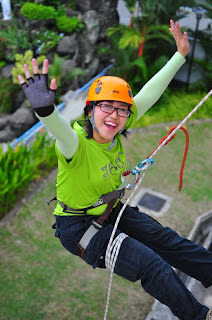 i went for Abseiling Proficiency Course 1 & 2 on the 30th of July, and 20th - 21st of August. APC 1's syllabus is on abseiling safety, with a belay line, soft lock, and triple leg loop. 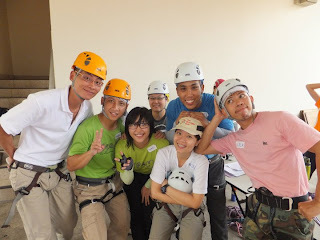 APC 2's syllabus was on rigging the main, belay, and safety lines, belaying, abseiling with an autolock, without belay, self-rescue and the Single Rope Technique. also covered and practiced were the miscellanous hitches and knots, and prussicks. i passed both APC 1 and 2.
we were also given a preview into APC 3, where changing rope and anchor line efficiency is required. i managed to attempt the changing rope technique, and succeeded, although i also found 3 different ways to jam myself. first with a single, second with a double, and third with a triple prussick jammed way beyond the reach of my short hands.